'Walking Dead' Exclusive: First Look at "Live Bait"! Exclusive ‘The Walking Dead’ Season 4 Photo: Who’s “Live Bait” for These Walkers? 'The Walking Dead' season 4 will fill in some major gaps with this Sunday's all-new installment "Live Bait," as we finally learn what became of the villainous Governor (David Morrissey) and his surviving crew after season 3 finale "Welcome to the Tombs." Who, or what the Governor came across in the eight months before "Internment" remains to be seen, but we've got an exclusive "Live Bait" image of what looks like a major "biter" battle to come! The Governor himself may not have won many friends with his assault on the Woodbury army, but there's at least one crowd who wouldn't mind getting a little closer to the one-eyed madman. Our exclusive image from this Sunday's "Live Bait" features a crowd of walkers on the prowl, but also raises one seriously disturbing question among us East Coast city-dwellers: what in the walker-filled world is a "pay pond?" A familiar face returns as each member of the group struggles to find his or her humanity in a world of constant threats. Of course, while we know the episode will follow the Governor since his defeat at the prison, still unknown are his intentions for lingering so ominously outside the fence in broad daylight this past week, other than "Spaghetti Tuesday," of course. Might the villain have turned over a new leaf, perhaps earning himself a pardon into another season? We'll find out with 'The Walking Dead' season 4's latest installment "Live Bait" this Sunday, but in the meantime check out our exclusive look at the episode below, and give us your predictions in the comments! 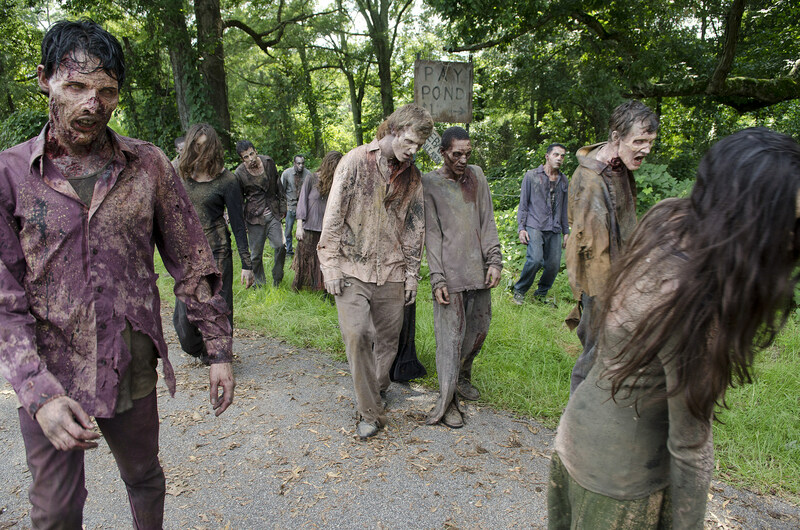 Source: Exclusive ‘The Walking Dead’ Season 4 Photo: Who’s “Live Bait” for These Walkers?